Live Blackjack Standard is a single hand version of the classic game that offers a live environment for a realistic experience. 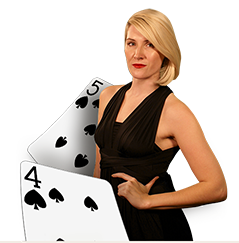 The game features a real human dealer just like in a traditional land-based casino. The only difference is the setup is in a professional studio with high-end cameras for ultimate quality. This game is ideal for those who prefer playing at a real casino. The game is played with six decks of 52 cards each and has seven positions to pick from. The limits for betting in this game is set from £1 to £2500 per turn on your hand. This casino byw bonws am ddim Blackjack game also shows various statistics on the screen to help you win effectively.